I returned to the 1920’s house I detected yesterday. This time I did the side yard. It was obvious right away that someone in the past used the side yard as a trash heap. I dug one of the high signals I was getting and I pulled this relic from our city’s past. 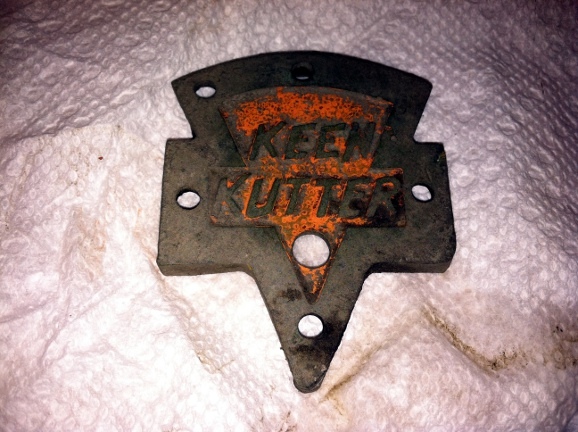 Keen Kutter was a trademark for a company that made cutlery and tools. I have seen vintage shaving blades made by this company. The Keen Kutter factory opened in Wichita in 1906 but I don’t know when it closed. The iconic building downtown was already abandoned when I came here in 1981. About twelve or thirteen years ago, the area where the building stood, known as Old Town, was renovated and the Keen Kutter building became a hotel. The logo displayed on this whatsit was used by the company around 1900. I understand that items bearing this logo are collectable but I doubt my unknown item is of any value other than historic. Still, I think it’s cool. I wish I had time and permission to sift through the trash pile. Who knows what lies beneath all that rusted iron!